By U2. P/V/C. Rock and Pop Rock. Songbook. With vocal melody, lyrics, piano accompaniment, chord names, guitar chord diagrams and black & white photos. 104 pages. Published by Hal Leonard (HL.306650). 14 of their finest from this decade: All I Want Is You * Angel of Harlem * Bad * Desire * I Still Haven't Found What I'm Looking For * I Will Follow * New Year's Day * Pride (In the Name of Love) * Sunday Bloody Sunday and more. The book remains difficultly open when playing ! Alternative binding solution: little metalic ringlets ! 44 of 74 people found this review helpful. 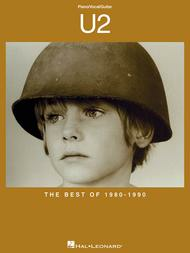 I thought this was an extremely good book, if you are a fan of u2. It has all of their best songs, and they sound great on the piano. In my opinion this is one of the best U2 piano books around. Bono Rocks!